This guide may also be useful to people with other phones and GPRS accounts with other providers. In order to use this guide, your PowerBook must be equipped with Bluetooth. Most modern PowerBooks have Bluetooth modules as standard. If you have an older PowerBook you can either use a Bluetooth USB adapter or use Card Blues Suite. You must have a Vodafone GPRS account activated on your phone with internet access, not just WAP or Vodafone Live! 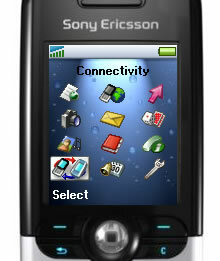 You will also need to download the Sony Ericsson modem scripts from Ross Barkman's website or you can download them from my mirror. You should copy the scripts into the Modem Scripts folder in the Library folder on the root driver - not in your user Library. These scripts work with the T39m, T68/T68i, T610, P800, P900, Z600 and should work with other Ericsson and Sony-Ericsson GPRS models. Click and select Setup Bluetooth Device... this will start the Bluetooth Setup Assistant. You can also start the Bluetooth Setup Assistant direct from the Applications -> Utilities folder. The assistant starts as follows with the following welcome. If you do not setup your phone to be visible (for some other phones this is the default) then you will see the following screen. Otherwise your PowerBook should find the phone, in this example the phone is called Paddington, most phones will probably be called by their model number, ie T610. 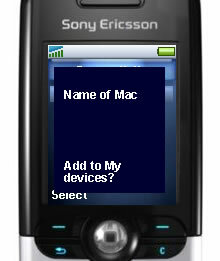 As you can see in this example, the Mac has also found another phone whilst searching. In a busy area this may happen a lot. Click the Continue button in order to now pair the phone. 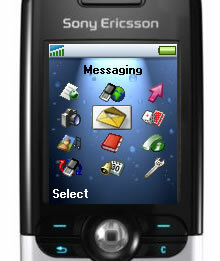 The assistant will display a number which will need to be entered onto the phone. Phone will ask whether you want to Add to My devices? You should now be able to click the Continue button. You can at this point allow your phone to sync with the PowerBook to transfer contacts and use your phone with the Address Book - useful for sending SMS messages via your Mac as outlined on the O'Reilly website. Ensure that Use a direct, higher speed connection to reach your Internet Service Provider (GPRS, 1xRTT) is selected. If you are using Vodafone GPRS, you can leave the Username and Password blank and enter internet as the GPRS CID String. Select Show All Available Scripts and select the script which matches the CID number on your connection. 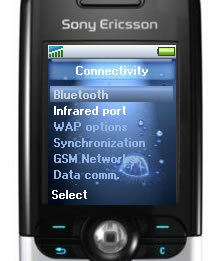 In this example I am using the Sony Ericsson GPRS CID3 +CGQREQ script. The +CGQREQ script may give better performance, but it might not connect on some networks. Therefore if you have problems use the other script with the correct CID. Unless you already have the Modem icon in your menu bar, open Internet Connect from the Applications folder. Click Connect to connect to the internet. If you select Show modem status in menu bar, then you will see the staus of the modem connecting and authenticating. You will also be able to quickly connect from the menu bar.